Almost 75 per cent of the monsoon season is over. By this time in the year, farmers, industries and citizens are able to start reaping the benefits of rainfall-filled reservoirs. But for the second year in a row, a normal monsoon has given India a miss. In June this year, the India Meteorological Department (IMD) had estimated that rainfall in the country would be deficient, sparking off fears of a drought. IMD’s latest press release dated August 26, 2015, stated that the cumulative rainfall received by the country since June 1 was 12 per cent below the long period average. The long period average of the country is 89 cm (1951-2000). It is unlikely that the situation will improve in the month of September. Low rainfall has impacted reservoir levels in many places, affecting irrigation and power generation which depend on the water. Some reservoirs also provide drinking water to citizens. The Central Water Commission (CWC), a technical wing of the Ministry of Water Resources, River Development and Ganga Rejuvenation, monitors the live storage status of 91 reservoirs of the country on a weekly basis. The live storage of a reservoir is defined as the portion of the reservoir water that can be used for controlling flood, production of power, navigation and downstream releases. 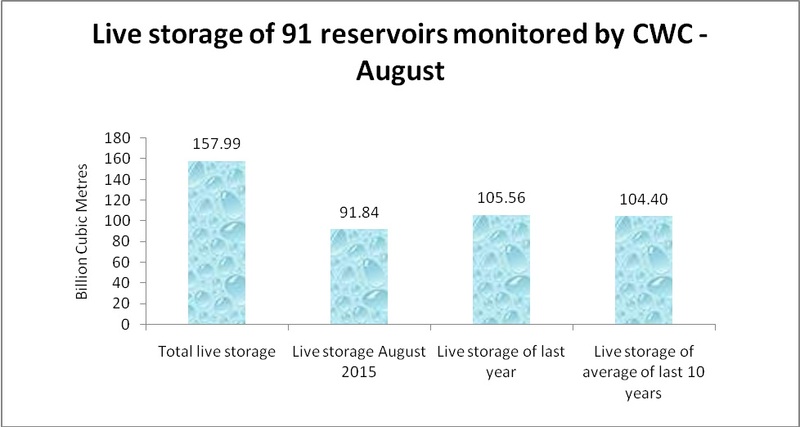 The monitoring reveals that until the end of August this year, reservoirs had reported a dip of 13 per cent as compared to last year (August 2014) and 12 per cent when compared to the last ten years’ average (for the same period). The live storage of reservoirs in Uttar Pradesh, Maharashtra, Odisha, Chhattisgarh and all southern states is far below normal. 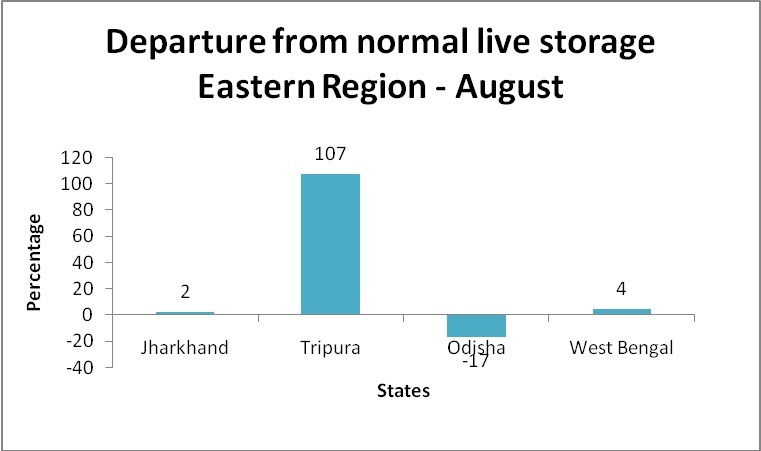 While Odisha shows a -17 per cent departure from normal live storage in eastern India, Maharashtra and Karnataka reservoirs have 37 per cent below normal live storage. Telangana and Andhra Pradesh fare the worst, with -75 per cent and -55 per cent departures respectively. The southern region houses the maximum number of reservoirs at 31. Of these, nine reservoirs are filled up to 40 per cent or less when compared to the Full Reservoir Level (FRL). Six other are filled up to 41-50 per cent FRL. The western region (Gujarat and Maharshtra) is next to the southern region in terms of the number of reservoirs (27). Seven of these reservoirs are filled up to 40 per cent or less compared to FRL. None of the reservoirs in these two regions are filled up to 100 per cent or the FRL. The central region consisting of Madhya Pradesh, Uttar Pradesh, Chhattisgarh and Uttarakhand also have poorly filled reservoirs. Things are slighly better in the northern and eastern regions. Odisha reservoirs, however, are in a very poor state. 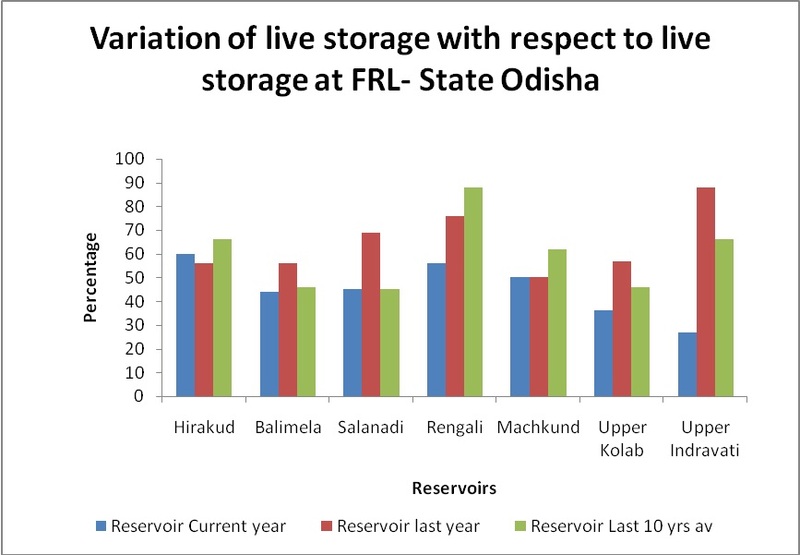 The data from Odisha shows that the current year’s live storage in different reservoirs has never crossed the ten years’ average live storage. The difference between these two values is huge, indicating that the situation is far from normal. 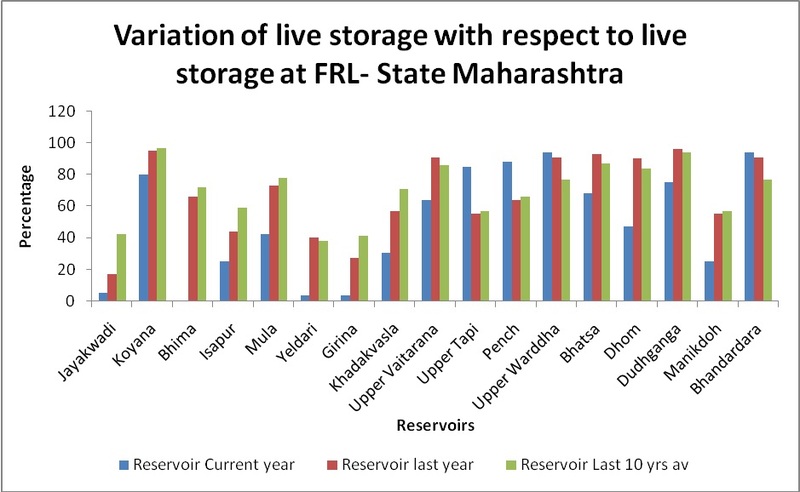 Maharashtra has almost 17 reservoirs and in only three of them, the current year live storage is over the ten years’ average live storage. The remaining eighty-two per cent are in bad shape. In Maharashtra, the Bhima reservoir, which has a current live storage of zero BCM (billion cubic metres), provides irrigation to 125,000 hectares and produces 12 MW hydel power, according to CWC. It must be asked whether the water for irrigation and power generation is coming from the reservoir’s inactive storage. Water in the inactive storage of reservoirs can only be pumped out and not drained out. This water helps sediments settle and cleans the water of the reservoir. Overall, water levels in reservoirs have been declining, especially in drought-hit states. While the current situation warrants the ringing of alarm bells, experts say states must also consider investing in decentralised and traditional water management systems to supplement irrigation and drinking water supply. Thoroughly written article on the subject. Congratulations.